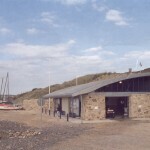 The new Bude RNLI Lifeboat Station is centrally located on Summerleaze Beach, on a most sensitive and prominent site, set within Maram grass sand dunes. Bude’s lifeboat history goes back as far as the 1850’s when the first RNLI funded lifeboat came to Bude, housed in a purpose built lifeboat station on the west side of the canal. The building is a focal point for Summerleaze Beach and is designed to be viewed from a variety of vantage points. It has no dominant façade but aims to be visually interesting on all elevations and if viewed from above the circular lifeboat station resembles a shell-like form. The station provides ground floor crew changing facilities plus a glass fronted circular crew room on the upper level giving panoramic surveillance of the harbour. During launch and recovery of the lifeboat this crew room will provide unobstructed views of the route through the sand dunes, across the beach and out to sea past the Bude breakwater. The brief from the RNLI directed us to carry out the design of Bude’s Lifeboat Station to an extremely high quality, specifying sustainable materials wherever possible and ensuring the building will resist the effects of severe weather in such an exposed maritime environment.